As an American Heart Association (AHA) Authorized Training Center, the Addison Fire Protection District is uniquely positioned to provide a host of BLS, ACLS, AED and First-Aid classes to both medical professionals’ and laypersons. Various different classes are hosted throughout the year at our headquarters fire station at 10 South Addison Road in Addison, Illinois. Additionally, our instructors can travel to different locations within the community or surrounding area to offer customized training based on the end user’s schedule and needs. 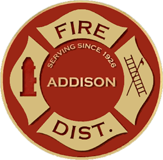 Besides teaching various classes, the Addison Fire Protection District is entrusted by the AHA to operate as a Training Center. We are tasked with being the principal resource for information, support and quality control for all AHA instructors that have aligned with the Addison Fire Protection District AHA Training Center. This means that we are not only responsible for ensuring the quality of the performance of our fire district AHA instructors; we have nearly 500 other AHA instructors from throughout the area we monitor. Have questions about CPR & First Aid classes? Click the button for a list of frequently asked questions and answers. Text Book # 15-1010 or E-Book 15-3102 (required). Students are required to purchase their own textbook or E-Book prior to the class date. These may be purchased on-line through numerous vendors. For example: eworldpoint.com, laerdal.com, & amazon.com. E-Book students are allowed to use mobile devices in class. BELOW PRE-REQUISITES MUST BE SUBMITTED PRIOR TO 5/7/16. Submissions can be sent to cpr@addisonfire.org or mailed to the Addison CTC at 10 S. Addison Road, Addison, IL 60101. AHA instructors are required to affiliate with a CTC in order to instruct classes and issue CPR cards. If you are already an employee at a training site that affiliates with the Addison CTC and are in good standing, you can pay your affiliation fee here. If you are enrolled for a BLS Instructor course at the Addison CTC and need to affiliate with us, you may pay your affiliation fee here as well. Students are required to provide an online course completion certificate for “BLS for Healthcare Providers Online Part 1” from the American Heart Association’s website. Many other companies offer online CPR training. However, we only accept the AHA’s certificate to take the skills assessment. Flexible scheduling. If interested in completing a CPR skills assessment, please click the button below to pay your fee and then email CPR@Addisonfire.org to schedule your assessment date. We encourage everyone to know CPR and what to do if a medical emergency should arise. If you are not trained in CPR, please consider getting certified….whether you choose to do it through our fire district or not. If you need recertification, are looking for a class or are just curious to see what we offer, please look at our scheduled offerings. Additionally, if you are an AHA instructor that needs to affiliate with an AHA Training Center or you are already affiliated with us, feel free to review our affiliation information section. Questions about everything discussed above can be directly emailed to our Training Center at cpr@addisonfire.org.